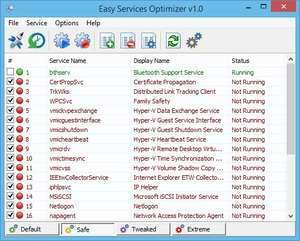 Easy Service Optimizer is a small utility application which can enable and disable certain Windows services from starting with Windows. The program focuses on services which most definitely are not required for every day usage of your PC such as Bluetooth, Remote Desktop Sharing and Remote Registry. The user interface of Easy Service Optimizer isn't too difficult to use and its straightforward lists and functions make it easy to enable and disable items. It's also possible to add more services to the program interface. For security reasons, you should also check out the Easy Service Optimizer download at LO4D.com which includes virus and malware tests. Additional screenshots of this application download may be available, too. Featuring the very best in free windows optimizer downloads. Editing staff adds reviews and free download links and constantly updates software. Check out some of the freeware downloads available in the windows optimizer category. They contain no strings and are available at zero cost. 4 out of 5 based on 17 ratings.